Mariam Al Mansouri of Abu Dhabi is the first Emirati female pilot in the country’s airforce. 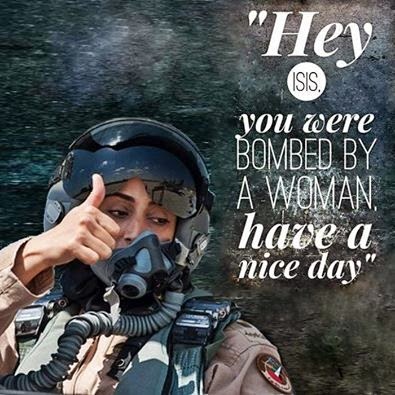 She has also become the first female pilot in the region to bomb Daesh after she took part in an Arab-Western coalition attack on Daesh in North Syria this week. “I the beginning, I had not expected to become a pilot of F16,” Mariam said in a film broadcast by Abu Dhabi television on Wednesday night. She was probably disowned by her clan. Building haris harassment should be a Crime! Eid Al Adha- 5 or 9 day Holiday? Guy skins live rabbit with his Teeth! What the heck is this Honda advertisement?